Have some MP4 files downloaded from online video streaming sites, ripped from disc media or shot with device recorders and wish to play the MP4 files on the newly purchased Xbox One X. The following article will show you how to get any MP4 files played on Xbox One X via USB. If you have a USB flash drive or external drive, you can plug that drive into the USB port on your Xbox One X for enjoy video or movies stored on the drive. The Xbox One X supports USB 3.0, the drive must be formatted in FAT16, FAT32, exFAT or NTFS. If you have a Mac, be sure to format the drive as exFAT and not with a Mac-only file system like HFS+. The play video on Xbox One X via USB, you still need to install the Xbox Media Player app, which isn’t installed by default, you’ll need to install it yourself from the Xbox Store. To launch the Xbox Store, head to My Games & Apps > Apps > Find more in the Xbox Store. Search for “media player” and install the Media Player app. If you try to play MP4 files encoded with other incompatible video codec such as MPEG-1, MPEG-4 (A)SP, Real Video, MVC, etc on Xbox One X from USB, you will see an error message. To fix the codec incompatible issue, what you need is simply a MP4 Video Converter. 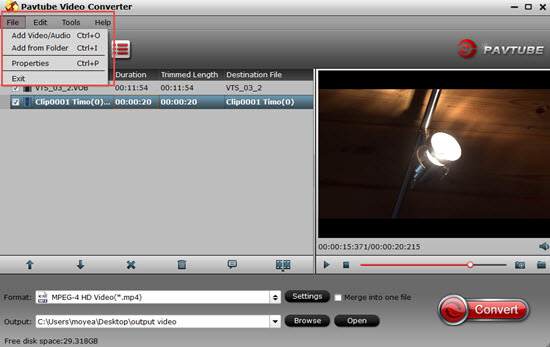 If you are looking for a powerful yet simple to use application to get the job easily completed, we highly recommend Pavtube Video Converter to you. The program supports batch conversion mode, so that you can load multiple MP4 video into the application for conversion at one time to save your precious time. The application allows you to transcode MP4 with unsupported audio codec to any of Xbox One X playable codec listed above with remarkable file quality. For people who plan to convert MP4 to Xbox One X readable H.264 or H.265 codec, you can take good advantage of the hardware encoding acceleration feature offered by the program. You can get up to 30x faster H.265 codec encoding speed as long as you run your computer on Maxwell (GM206) or Pascal based Graphic card that supports Nvidia NVENC technology or up to 6x faster H.264 codec encoding speed as long as you run your computer on Graphic card that supports Nvidia CUDA or AMD App technology. To get better output video and audio quality, just click “Settings” on the main interface to open “Profile Settings” window, here, you can flexibly adjust the output profile parameters such as video codec, resolution, bit rate, frame rate, audio codec, bit rate, sample rate, channels, etc as you like. For Mac users, you can go to download Pavtube Video Converter for Mac to do the same conversion on macOS High Sierra, macOS Sierra, Mac OS X El Capitan, Mac OS X Yosemite, Mac OS X Mavericks, etc. Step 1: Load unsupported MP4 files. Download the free trial version of the program. Launch it on your computer. 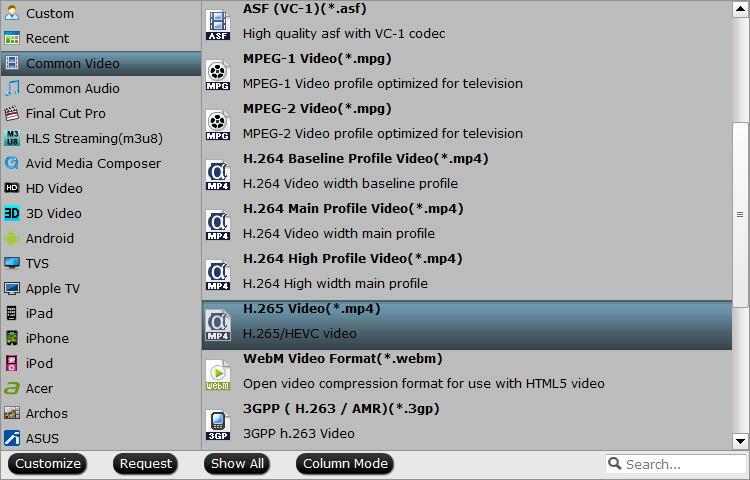 Click “File” menu and select “Add Video/Audio” or click the “Add Video” button on the top tool bar to import unsupported MP4 files into the program. Clicking the Format bar, from its drop-down list, select one of Xbox One X playable file format listed above. If you own a 4K TV, you can directly output Xbox One X supported 4K file formats such as “H.265 Video(*.mp4)” under “Common Video” main category. If you just own an HDTV, it would be much ideal for you to export Xbox One X readable HD file formats such as “H.264 HD Video(*.mp4)” under “HD Video” main category. 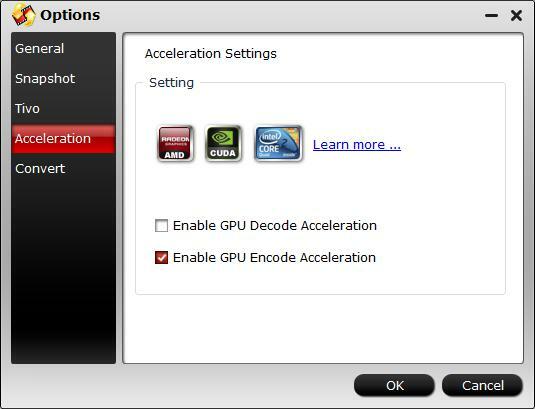 Click “Tools” > “Options”, in the opened “Options” window, click “Acceleration” menu, then check “Enable GPU Encode Acceleration” otpion so that the program will accelerate conversion speed when encoding MP4 video to H.264/H.265 codec. After all setting is completed, hit the “Convert” button at the right bottom of the main interface to begin the conversion process from unsupported MP4 to Xbox One X playable 4K or HD formats. Connect the USB drive or external hard drive to your computer and copy the converted MP4 files onto it. Eject it from your computer and connect it to one of the USB ports on your Xbox One X. There Xbox One X has three USB ports you can use: Two on the back of the console, and one on the side.